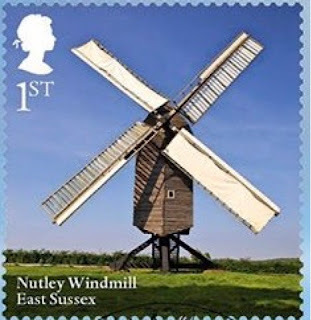 Thanks to the first day cover producers and another blog, whose author is not bound by the same rules as we are, the designs of the Windmills and Watermills set to be issued on 20 June is now available. The set consists of 6 stamps, two each 1st class, £1.40 and £1.57. It's an attractive set which covers all four nations of the United Kingdom, but which necessarily omits some areas completely, notably East Anglia. People in Norfolk would point to the many sails which were to be seen on the Norfolk Broads - but others would then be able to mention that a big percentage of those were wind-pumps rather than mills. 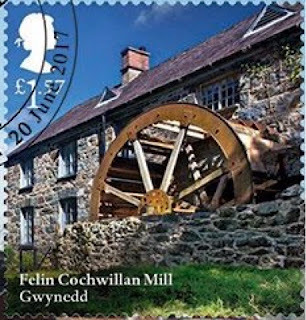 But my fellow author WhiteKnight has much more to say here on his Commonwealth Stamps Opinion blog, which is well worth a read, and which also suggests some other mills which Royal Mail could have used to cash in on the topics. Interesting, too, that all the photographs show blue skies, with just a few clouds. There's often much more wind to drive the sails when the skies are cloudy!